Headlines > EU affairs > Current page:: Sakharov Prize: "Raif Badawi was brave enough to say no to their barbarity"
"Raif Badawi was brave enough to raise his voice and say no to their barbarity. That is why they flogged him," said Ensaf Haidar, the wife of jailed Saudi human rights activist Raif Badawi, accepting the 2015 Sakharov Prize for Freedom of Thought on his behalf in Strasbourg on 16 December. 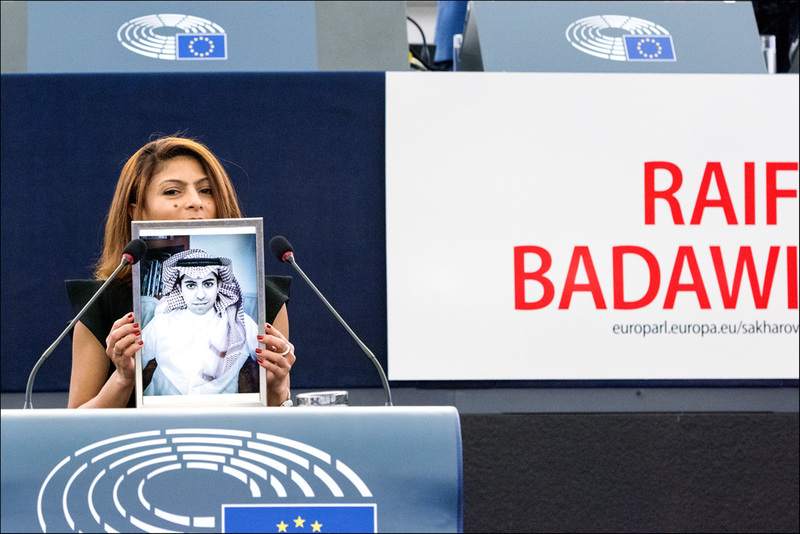 Badawi was honoured by the European Parliament for his fight for freedom of speech and thought in Saudi Arabia. She continued: "He is just a thinker who refused to be part of the herd following clerics living outside of time and governing by injust and tyrannical laws." Haidar thanked the European Parliament for the award: "Awarding the Sakharov Prize to Raif Badawi is historic. It is, Mr President, an act of bravery by you and by all those who voted for Raif." Schulz also welcomed representatives from the 2015 Sakharov Prize finalist present in the public: Maria-Alejandra Aristeguieta-Alvarez representing the Democratic Opposition of Venezuela and Olga Shorina, the Executive Director of the Boris Nemtsov Foundation for Freedom in Germany . Unfortunately Badawi is not the first Sakharov laureate unable to receive the prize in person the same year. Among many others, Aung San Suu Kyi was only able to receive the prize in person 23 years later after being awarded the Sakharov Prize. Representatives from the 2015 Sakharov Prize finalists were also present in the public: Maria-Alejandra Aristeguieta-Alvarez representing the Democratic Opposition of Venezuela and Olga Shorina, the executive director of the Boris Nemtsov Foundation for Freedom in Germany . Watch the recording of the ceremony on our website or follow the debate on social media using the hashtags #SakharovPrize and #FreeRaif. And learn more in our top story. Ensaf Haidar, the wife of this year's Sakharov Prize laureate Raif Badawi, talks about his harrowing situation and hope for release in early 2016.